1. Why you should keep your medicine in a cool and dry place? 2. How can you organize your medicine according to the group? 3. Why should you check your medicine cabinet at least once a year? 4. How to dispose the drugs properly? 5. What can we get from organizing our medicine cabinet? As your medicine cabinet plays an important role in maintaining your health and that of your family, it pays to have it managed and organized properly. After all, you wouldn’t want to have a medicine cabinet that you can’t rely on. Follow these steps in making sure that you have a well-organized medicine cabinet. Step 1: Make sure your medicine cabinet is in a dry and cool place. Warning: Most medicine require a cool and dry place for storage. 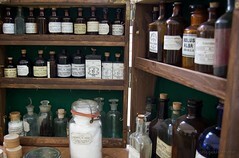 Though it is popular to have the medicine cabinet in the bathroom, doing so would be detrimental for medicine storage. Since the cabinet is exposed to steam and moisture, it can prematurely make the drugs unusable, well before they’re expiry date. Step 2: Organize the drugs and items in the cabinet by class. Warnings: When things are classified under groups, it would be easier to locate them in the cabinet. You can group the drugs for their treatment purposes, like ones for headaches, colds, or fevers. You can also organize them according to the group what’s easier for you. If you want, you can organize alphabetically, so you can easily find what you need, provided you know the name of the drug. Step 3: Check your medicine cabinet at least once a year. Warning: You should do this to check for expired medicine that might still be in your cabinet. Drugs past their expiration dates should be disposed of properly, as some drugs can become toxic and poisonous. Also, it’s a great time to re-stock on some of the medicine that you’re low on. Don’t wait until you run out of supplies. You should also check the packs of the pills and tablets for any damage or contamination. Torn packets or soggy-looking pills and tablets should also be thrown away. Warning: Look at the packet or instruction that came with the medicine for specific disposal instructions. For tablets and pills that don’t have specific directions, you can flush them down the toilet. You can also take advantage of local drug take-back programs that accepts expired drugs for proper disposal. It pays to keep your medicine cabinet organized. When the medicine cabinet is well-managed, it means you’re always prepared for emergencies because your cabinet is well-stocked with what you may need. Moreover, it ensures that the medicine you’ll take is safe and not past its expiry date. First Aid Kit – All about first aid tools and equipment. Camping Packing Items – Things from your medicine cabinet you need to bring. Diet and Exercise – All about fitness, health, and medicine. First Aid for Burns – All about first aid and medicine. Medicine cabinet is being used everyday. We look at it but we did not see that it is really full of unuseful items like expired medicines, dental floss and those skin treatment regimen that we quit almost months ago. This a total disaster to think that a medicine cabinet need its own first aid. I have here a to do list to save the medicine cabinet. First, throw any items that are out of date examples of that are toothbrushes ( 3 month old), unused sunscreens and gunky nail polish. Second, disinfect the mirror, shelves and interior thoroughly. Third, categorized those useful items like vitamins, medicines and etc. Fourth, use small baskets or trays to pile up items and put your most frequently used items at the bottom. And lastly, put the remaining items in a see-through containers. My brother read this article and asked, “why do Medicine Cabinets need to be organized?” A stupid question perhaps but nevertheless, should still be Answered. Medicine Cabinets play an important role in our daily lives, medicinal products, toothbrushes and other products are in there. So it is important to keep it clean and organized, it is also important to take into note the expiration dates of medicines because once expired they can cause adverse effects to the human body and may do more harm than good. I advised to keep a separate section for emergency medications and label it. We have a tackle box at home that contains anti-asthma, anti-hypertensive drugs, anti-allergy and Ipecac for vomiting. That way, in cases of emergency when everyone is under stress, everyone can just ask anyone to bring the tackle box instead of having him/her look for it in the cabinet one by one. We keep a logbook for all the expiration dates of medications we have at home. We check it periodically to update it.